In my last article I discussed about the Multiple Sequence Alignment and its creation. Now in this article, I am going to explain the workflow of one of the MSA tool, i.e., MUSCLE. MUSCLE is a software which is used to create MSA of the sequences of interest. MUSCLE is one of the softwares which is known for its speed and accuracy on each of the four benchmark test sets ( BAliBASE, SABmark, SMART and PREFAB). It is comparable to T-COFFEE & MAFFT (these tools will be explained in upcoming articles). 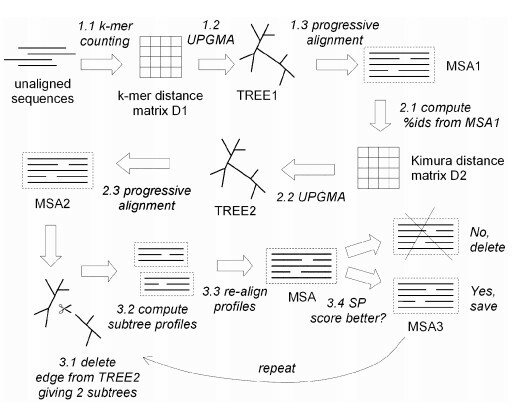 Two distance measures are used by MUSCLE for a pair of sequences: a kmer distance (for an unaligned pair) and the Kimura distance (for an aligned pair). A kmer is a contiguous subsequence of length k, also known as a word size or k-tuple, i.e., it decides that how much alphabets in the sequences will be searched & aligned together. Kimura distance is the measure which is based on the fact that multiple substitutions occurs at a single site. computes the pairwise percent identities ,i.e., how much percentage of the sequences are aligned/matched and convert it to a distance matrix applying Kimura. again followed by a progressive alignment and forms MSA2, and forms tree. again repeat from the step 6, and finally gives a clustered MSA. This is how MUSCLE works. MUSCLE alignment is also used in MEGA6 tool which is used for phylogeny tree construction. Every software or tool has its own benefits depending up on the needs under consideration. There are various other tools also available for MSA such as T-COFFEE, MAFFT, etc, which have high accuracy and speed. They will be explained in upcoming articles.